Newcastle boss Rafa Benitez has made seven changes to his side to face Watford. Rafa Benitez has made seven changes to his side for today's FA Cup clash with Watford. Only Jamaal Lascelles, Matt Ritchie, Isaac Hayden and Sean Longstaff have kept their places following the 3-0 win over Cardiff last time out. with wingers Jacob Murphy and Kenedy among the players coming in. The Magpies face Manchester City on Tuesday night, which may have influenced Benitez's decision to rest some of his senior players. Meanwhile Hornets boss Javi Gracia has named a completely new side for the game at St James's Park, making 11 alterations following his side's last league game. 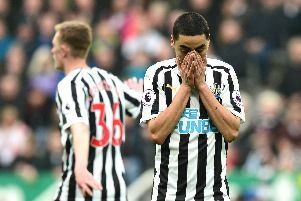 And while some Newcastle fans were happy with Benitez's team selection, others couldn't understand why the likes of Salomon Rondon and Fabian Schar have been left on the bench. @PrimeHatem: Best line up we could wish for considering all the Injury's and where we are in the league HWTL!! @Lehalt: It's obviously a weakened team. With Lejeune being the best CB we have at the club imo. @ian_cowx: Doesn’t seem to be our strongest possible 11. @Venezuxlan: Why Kenedy over Roberts?